जाउँ कता खै कुन ठाउँ शान्ति मिल्छ ? गाउँ कता गै कुन ठाउँ भ्रान्ति निल्छ ? ओ हनी ! त्यो अलि चाडै भएन र ? “व्हाट अ सेम हनी ! किन मैले तिमीलाई एउटा उत्तराधिकारी समेत दिन सकिन ? हरे भगवान मैले मात्र पैसाका लागि कसरि आफ्नो कोख बेचें ? के भाडाकी आमा सरोगेट मदरका कुनै पीडा हुन्दैनन ?? आफ्नो गर्भ गृहमा जन्मेको बच्चा को कुनै कानुनि हक हुदैन ??? लामो लाइफ थ्रेतेनिङ्ग अप्रेसन पछि उनको डेलिभरी सकिन्छ | एउटा स्वस्थ बच्चा हस्पिटल थर्काउने गरि रुञ्छ | चियाँ ! चियाँ !! चियाँ !!! वरी परिका सबैमा एउटा ठुलो खुसि त्यो रुवाइले ल्याउछ | त्यो खुसि जसको प्रतीक्षा मा एउटा सिंगो जीवन जोन र जेनिसाले तड्पिरहेका थिए | खोजि रहेका थिए लामो समय सम्म | तिनले के गरेनन सन्तान सुखको लागि ? संधै हरेस खाने त्यो दम्पति आज आफ्नो काखमा बच्चा रोइ रहेको सुन्दा अवाक भए | एक छिन केहि पनि बोल्न सकेनन | यो सपना हो कि बिपना ? 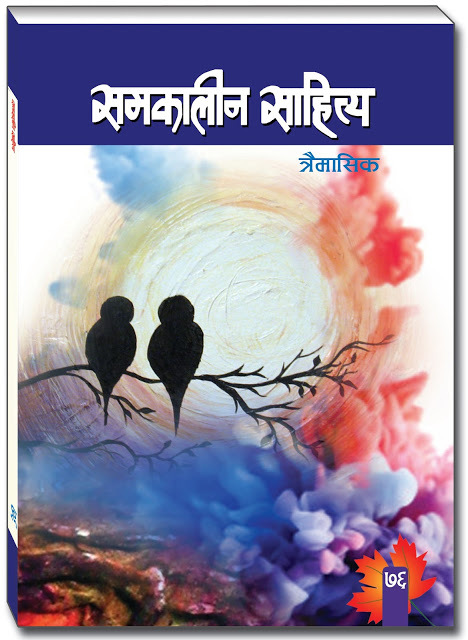 जन्मनु मर्नु स्रिष्टॆका आफ्नै नियमितता हुन् | आज उ जन्माइएको छ | आधुनिक विज्ञानको चमत्कारका रुपमा एउटाको रक्त भएर अर्काको कोखमा हुर्केर धर्तीमा खडा भएको छ | हिजो यो सम्भब थिएन | आज सामान्य भएको छ पैसा हुनेहरुका लागि | आफ्नु कोखमा राख्ने झन्झट नगर्ने हरुकालागी यो केहि लाख रुपैयाको खेल भएको छ | भोलि यो बिज्ञान कहाँ पुग्ने हो ? मत्रित्तो को परिभाषा खुम्च्दै गएको यो बर्तमानमा भोलि कसरि प्रस्तुत होला ? In many countries, the future of energy is now at the very top of the agenda. 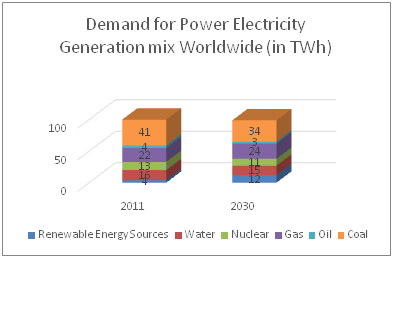 Demand for electrical power is growing three times as fast as the world’s population. By 2030, global electricity requirements could increase by two-thirds as illustrated in figure below. At the same time, the challenges facing energy markets could scarcely vary more. While energy demand is increasing, cost-efficiency and, in some cases, climate protection are at the top of the agenda in most industrial countries. 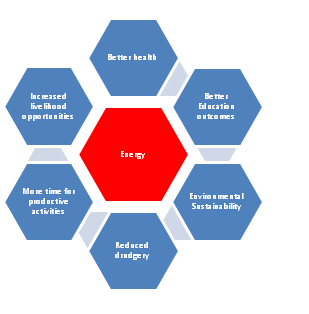 In all economies, however, sustainability and efficiency are essential as illustrated in below energy matrix. Two of our neighboring countries India and China now account for about half of global energy demand and its appetite continues to grow. How much energy will need when they reach the US and European level? According to the IEA, this figure will double by 2030. 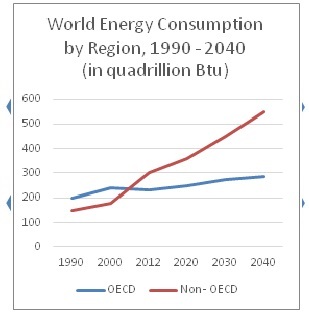 Figure above illustrates that the World Energy Consumption 1990 – 2040 by OECD and Non – OECD Countries, where we can see very clearly booming towards Non – OECD Countries. Each energy sources has its own advantages and disadvantages, however, we have to try them together to ensure sustainable future for energy customers around the world. Traditional source of energy like Oil, Coal and Gas could run out in the next century. 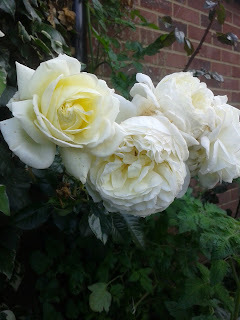 Unless alternative sources are found and start to adopt the energy mix. World needs to find a way to produce more electricity in a cleaner, greener way if we don’t want to suffer an energy crisis in the very near future. Nepal’s electricity demands are currently met by energy generated 99% from hydro power, which is not an energy mix. By finding the right mix of energy sources, Nepal can balance out the strengths and weaknesses of each individual source. We believe that the largest part of the mix must be hydro power since Nepal has estimated 45,000 MW of technically feasible hydro power including over 100 MW of micro hydro power. 2100 MW of solar power, 3000 MW of wind power and Similarly, it is estimated that 1.1 million domestic bio-gas plants can be developed in the country. so we have to harness energy from various sources equally for future reliability. Ironically, despite having that much energy mix Nepal is suffering long load shedding every day. To meet the growing electricity demand, imports from India have increased over the last 15 years. In 2014 – 15, Electricity imports from India accounted for 27% of total energy supply in Nepal. Therefore, investments in hydro power can help the country address its crippling power shortage problem, and can be best addressed by the private sector in the immediate and medium – term future given the financial limitations of Nepal Electricity Authority and the Government of Nepal. I would like to argue that, history of Hydro power development is really sluggish. Most of the projects have been delayed on their promised scheduled. Political corruption and financial inabilities are the main reason behind it. Table below shows some projects Time overrun situation. As most of the donor funded projects tend not only to incur time overruns, but also cost overruns. In addition, Inadequate planning and investment in generation, transmission, and distribution, delays in project implementation due to the lack of adequate legal and regulatory frameworks to resolve land acquisition, and rights of way and forest clearance processes have hampered the development of hydro resources, resulting in the severe underdevelopment of energy infrastructure. Furthermore, most of the hydro power projects are Run of River type which depends on the monsoon and flow of river so in dry season, they only produce below half of their capacity. Kulekhani I and II, totaling 92 MW, is the only storage project in Nepal. Nepal should have developed more storage type Hydro Power, however, which is obviously very costly and time consuming. The main reason behind this time and cost overruns is mostly due to NEA’s centralized and prolonged procurement processes, to ghost contractors leaving work to be executed by inexperienced and technically and financially weak local contractors, low project readiness at project approval, weak project management capacity of NEA . Moreover, deferred investment in electricity infrastructure has caused severe power cuts compelling industrial and commercial entities to operate costly generators. The import of petroleum products exceeds total exports and thereby is a major reason for the country’s large trade deficit. In the absence of cost – based tariff adjustment for the last three years, the financial health of the NEA has deteriorated making it unable to invest in infrastructure to meet the rising demand for electricity. The total losses of NEA at present have reached NPR 27 billion despite the government written off NPR 27 billion in 2011 . In this situation, Nepal should have to think seriously about their energy mix. As Nepal have plenty of other renewable energy resources as shown in the table above. Nepal should have to invest in PV solar, Wind turbine, small hydro and Bio mass simultaneously with big hydro project for long run solution as PV and Biomass can help to maintain present energy crisis very quickly. As renewable energy sources in power generation continued to increase in 2015, reaching 2.8% of global energy consumption, up from 0.8% a decade ago. At the individual country level, RE sources are already playing a vital role in some countries. Denmark leads, with 66% of power coming from renewable, followed by Portugal with 30%. Among the larger EU economies, the renewables share is 27% in Germany, 24% in Spain, and 23% in both Italy and the UK . Renewable Energy implementation and projects are needed to be promoted by the government of Nepal. These projects require Renewable Energy Technology procedure to sell their energy. The GoN must be lenient to introduce an investment friendly RET as Nepal has a great potential in Solar PV, Wind Energy, small Hydro and Biomass. Energy Efficiency measure should be implemented very seriously. Nepal should invest huge amount on modern infrastructure to save T&D losses. In successful measuring energy efficiency performance to raise industrial efficiency, government can play several important roles and should be especially aware of its influence on policy development and data collection. Proper use of measuring energy efficiency performance, international sharing of policy information and practical cooperation with industries are critical to the society –wide conservation of energy. Nevertheless, Nepal’s energy problems are arguably rooted more in shortages of governance than of pure supply. The energy sector suffers from widespread inefficiencies, including transmission and distribution (T&D) losses that exceed 34 percent which is highest in the region according to World Bank data. NEA has lost billions of rupees. The losses are caused by bad equipment, poor maintenance, and energy theft. BP, Renewable Energy – 2015 in Review statistical review of world energy Energy Economics BP Global, 2015 www.bp.com/en/global/corporate/energy-economics/statistical-review-of-world-energy/renewable-energy.html.